The Cosmic Cat remembers a time when his ancestors were the pets of humans, before the Longcat came and raised the feline consciousness to far beyond that of the hairless monkey men. Click here to play! Soon after, cats dominated the world and made pets of those who used to be their masters. They discovered the secrets to space travel and even eternal life. Unfortunately, the hunger for mice was not removed from the uplifted kitties of Longcat's blessing, and they hunted the creatures close to extinction. Just when it seemed that cats would be free of mice and free of the hunger for them, the dark times of Tacgnol, Longcat's nemesis, came upon the cats. The mice gained intelligence equal to that of cat and a terrible war was waged that saw mouse and cat kill one another with mallets, anvils and comical dynamite explosions. Cosmic Cat remembers the war as the last time he saw his family. Now, the Cosmic Cat floats through space, chasing after the last of the Mouse Empire. There is but one mouse and one cat remaining, and their final battle will be the dying breath of intelligent life in the universe. The humans remain, sure, but could they ever really be considered intelligent? No, when the Cosmic Cat eats the only mouse alive, the galaxy will grow dim once more and Tacgnol will have had his last laugh as Longcat's glorious era fades beyond memory. 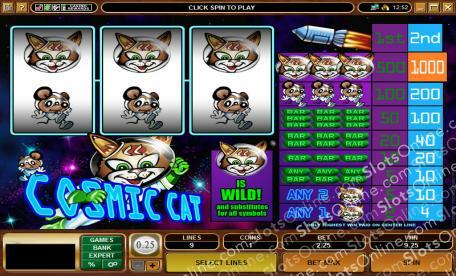 Humans may plunder the vast fortunes of the fallen Cosmic Cat Empire by playing the Cosmic Cat slots. With a space faring cat and mouse, as well as BAR symbols, you can have plenty of fun with these simple 3-reel classic slots. The Cosmic Cat symbol is wild and substitutes for any other symbol.